Here is a list of best free folder compare software for Windows. These software are used to check whether two folders are similar or not. Using it you can also verify the differences between source and target folders. These software basically compare contents or files contained by folders. They check various parameters like name, size, date, time, file extension, etc., to figure out the differences between the folders. These folder compare software also provide their own file explorer to find and add folders to them. Before performing the comparison, you can also apply filters (date, new, old, size, name, etc.) to get the desired comparison results. Almost all of these software provide split interface to make the task of comparing folders and files easy. Feature to compare files is another useful trait which is available in some of these software. Through file comparing feature, you can easily compare text of two documents line by line. All the differences or similarities are marked in various color schemes which really help during text document comparison. Various color schemes are also used to highlight the common or unique content between folders. Various handy features like synchronization, move or copy content of source to folder destination or vice versa, etc., are also available in few software. Plus, some of them also let you save comparison result in few formats such as PDF, TEXT, etc. BS Folder Compare is my favorite because its simple interface makes the task of folder comparison really easy. In its comparison result, you can view all identical and non-identical contents of folders side by side. It also has a selection mode to include or exclude folders content according to their file extension, which is another handy feature of it. Meld is another good folder compare software and its main advantage is its ability to compare three files, folders, and directories with each other at a time. It also provides various filters to filter out undesired results. You can also check out some best free Folder Sync, Folder Hider, and Delete Empty Folders software for Windows. BS Folder Compare is a free folder compare software for Windows. It is used to examine the identicality and differences between the two folders. Through its simple interface, you can easily add folders on Folder 1 and Folder 2 section. After that, you need to click on Process Button to start comparison. A complete report consisting of file names contained by the folders will open up on default browser. On the report, you can view all non-identical files of Folder 1 on the left side, while non-identical files of Folder 2 on the right side. Even if a single file is not matched between added folders, this software declares those folders as non-identical. The interface of this software also provides a comparison report. This report contains all identical as well as non-identical files between added folders. This report is more informative than browser report because this report provides identical files as well while browser report does not. Selection mode is another good feature of this software. It is used to include or exclude the files based on their file extension. You can manually write the file extension which you want or don’t want in folder comparison result. All of these features make it one of the best free software to compare folders. Meld is an open source file compare software for Windows. The main feature of this software is its three-way comparison feature. This feature lets you compare three folders, directories, and files with each other at a time. After launch, it asks you to add files, folders, or directories that you want to compare. Further, you can also apply filters like Same (to show only identical content between folders), New (to only view the newer files of folders), Modified (to show similar files that are slight modified), etc. You can choose single as well as multiple filters at a time to get the desired results. Split display and color scheme to highlight similar or unique files also make folder comparison easy. Its file comparison feature is also useful as it lets you compare text of two or three files side by side. All the differences between the text of tested files are highlighted in green color and remaining common text remains the same. You can also setup synchronizing points for texts, to quickly make certain part of text file similar in both files. Here, you can also compare multiple files and folders simultaneously by using its tabular interface. Apart from various features, I also liked its polished and premium looking interface. Compare Advance is another free folder compare software for Windows. You can also use it to create backup of data as well as for synchronizing data between different folders. Using its internal file explorer, you can add folders that you want to compare. After that, just click on compare button to start comparison. As comparison result, you get various Tabs named, Overview, Folder 1, Folder 2, Same, and Different. Folder 1 and Folder 2 tabs provide all the files contained in these two folders, respectively. Same tab shows files which are identical between folders, whereas Different tab shows all non-identical files. However, Overview tab provides all the files of both folders. Various information namely, file name, size, and creation date of files are also provided in these tabs. In this folder comparison software, you can also view various important statistics such as count of common files, size of common files, size of total number of files in folder 1 or 2, count and size of non-identical files, etc. Some other options to open files, copy files to another folder, and deletion of files are also available. Complete comparison report or some selected part of that report can be saved in HTML or Text format. DSH Directory Comparator is yet another directory and folder compare software for Windows. It uses split interface to compare two directories or folders side by side. Process of adding folders is a bit tricky here as its file explorer only shows system drives. It makes the task of finding the right folders lengthy. Still, it accomplishes the task of comparing folders quickly. 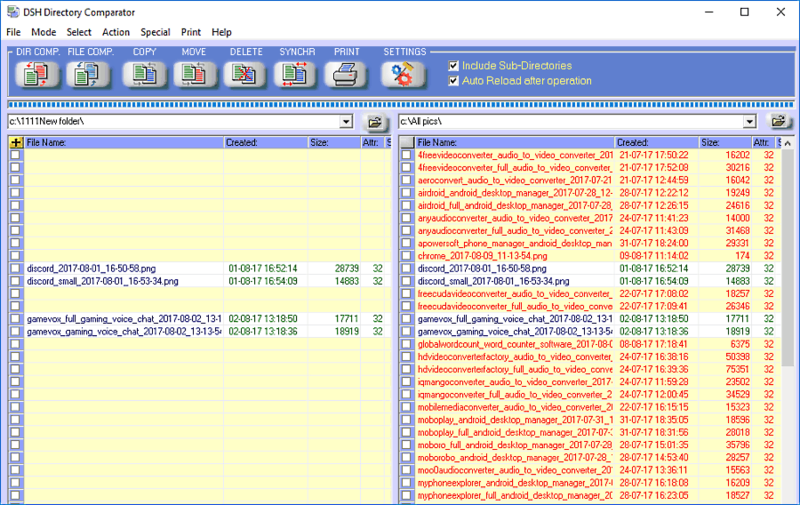 All common files or contents between two folders are shown side by side, to help you identify the common files quickly. Its color scheme for the comparison of content of different folders also help. You can also compare folders according to date, time, smaller file size, larger file size, etc. This folder comparison software is also capable to compare MP3 files, which is a unique feature as not many folder compare software have this feature. It also has a synchronize feature that synchronizes two folders by copying the missing files and overwriting the same older files with the newer ones. Basically, it makes two folders identical. You can also view, copy, move, or delete the content of folders. After comparison, you can save result in .dss and PDF formats. Note: During testing, its feature to compare files did not seem to work correctly. 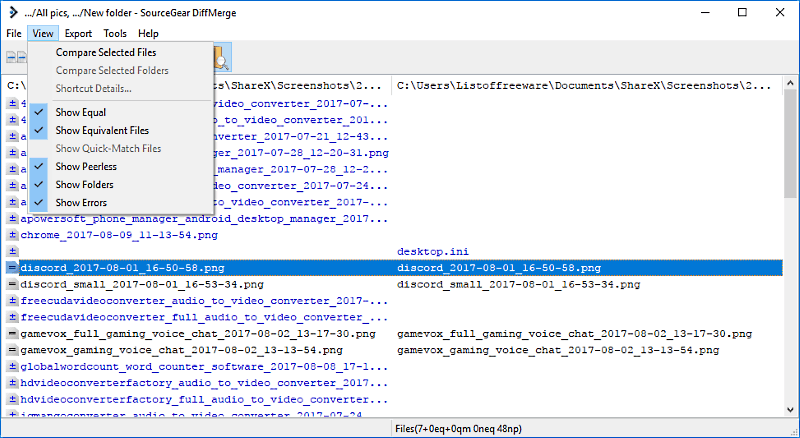 DiffMerge is a free file merger and file comparison software for Windows. It also has a feature to compare two folders with each other. You can easily add folders to this software by going to File Menu. Here, you don’t have to press any start button to start the comparison process, instead go to its view section to view result. View section contains various options such as show equal, show equivalent, show peerless, show folders, show errors, etc. If you want to view common files between added folders, then you can choose show equal option. Show equivalent shows those files that have minor differences such as blank spaces. Using Show Peerless option, you can view those files which are present in only one of the two folders. In this software, you can also compare the content of different documents side by side using File Diff feature. This feature automatically highlights all the differences between two text documents, which I find really useful. WinMerge is a free software for comparing and merging files and folders. This software provides a simple folder comparing feature, using which you can compare two folders at a time. You can also apply filters according to file extensions before file comparison process. Most filters provided here are related to various programming language like ASP.NET, visual C#, etc. After comparison, you get a list of all files contained in both folders. Files which are identical in both folders are described as “Binary files are identical”; files which are in only one of the folders are termed as “Left only” or “Right only”. The available result can also be saved as a project file for later use. Its feature to compare files and documents is also good as it highlights all the differences between the text of two files. Plus, it also lets you edit both documents that you are comparing. Merging is another important feature and by using it, you can easily merge two folders into one. Code Compare is another free files and folder compare software for Windows. This software is mainly used by programmers to compare programming codes of two files. But, you can also compare folders with it. It has an option named new folder comparison which is used to add and compare folders. A split interface is provided by this software to add one folder on left side and another folder at the right side of interface. After the test, you can view all the common content of both folders at the top of the list. Non-identical content of left side folder is marked in red color, while the content of right side folder is marked as green. You can also access and view all the contents of folders directly from the Result list. This software also has many other handy features like synchronize folders, find and replace feature for documents, hide identical files, etc. The result of folder comparison can be exported as a project, while file comparison result can be saved in various document formats. Note: Some features of this software like compare line by line, difference explorer, etc., are locked in this free version. To unlock all the feature, you have to buy its pro version. DirDiff is a free and portable folder compare software for Windows. Through it, you can compare directories, folders, or even individual files with each other. In DirDiff, you can add and compare two folders, at a time. On its interface, you can view contents contained by both folders in a single list. In this list, unique contents of both folders are highlighted in different colors (red and green) and common content remains white. Files and documents contained by folders can also be modified directly from this software. 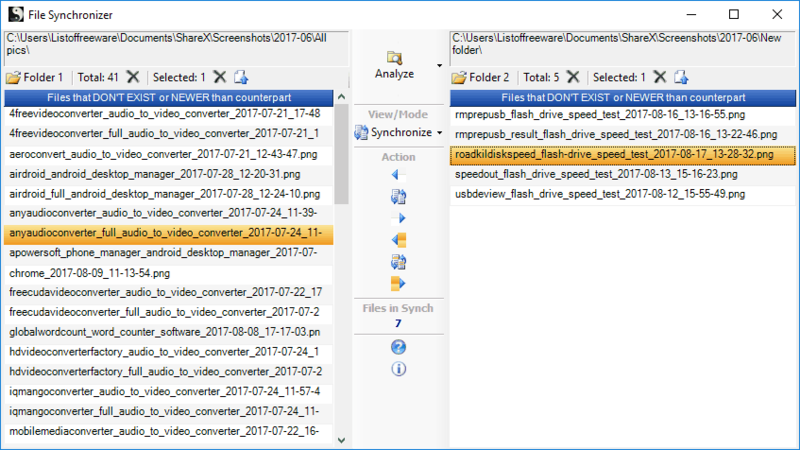 Through its file comparison feature, you can also compare two files. Instead of showing the text of files side by side, it actually superimposes the text of one file to other. All the common text remains the same. And, unique content of one file is marked in green and other’s in red, so you can quickly identify the differences. It also has some additional features that you may find useful, like option to view the structure of XML document, find in feature to find any particular text, floating drag handle icon to quickly add documents or files for comparison, etc. DiffDaff is another alternative for a free software to compare folders. It can also be used to compare files, and web pages. Using it, you can compare two files and folders at a time. You can also compare folders that have sub folders in it. Text can also be compared using this software, but special characters used in word and excel file formats are not supported by it. To compare folders, you have to add two folders in it. Now, choose one of the output file format named HTML and HTA. HTML results opens up in a web browser, whereas HTA result open in different window of DiffDaff. From the results, you can easily identify common and unique contents because of the use of highlighting schemes (green and red). Comparison result also incorporates partitioned interface to split the content of folders. After comparison, you can save this result in HTML or PDF format. FreeCommander is an advanced folder compare software for Windows. It is also used as an alternative of Windows file explorer. Its main feature is its dual panel file explorer window, through which you can open and compare files and folders of the system. Various features and it’s beautifully designed interface make any task easy. To compare folders, just select any two target folders through its dual panel file explorer. On the toolbar, you can view various sections like File, Folders, View, etc. You have to go to Folders menu and click on Compare option or simply press Alt + v to start comparison process. In output, you get only unique files of both folders on their respective sides of the panel. The only limitation of this software is that it does not show common contents between folders. 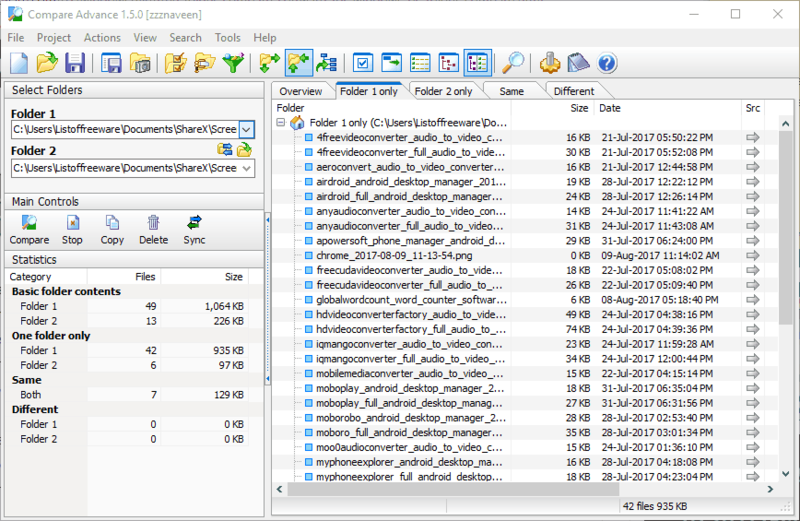 It also has various other handy features like Synchronize (to make content of two folders identical ), Dedicated file comparison option (to compare the text of two files side by side ), Filters (to filter out the undesired result according to the selected parameters), size of folders (to view the size folders files), etc. MOBZync is yet another free folder compare software for Windows. It is small and easy to use software, but has all essential features to compare folders. Mainly it provides three features named folder comparison, synchronization, and copy. It also provides split interface so that you can compare the content of each folder side by side. To further help you identify the content, it provides bullets of different colors such as Black (unchanged content), Green (Newer Content), Pink (added content), Red (Older content). These bullets simplify the identification of similar and different content between folders. It also shows the total number of files in each folder. Its synchronize feature simply copies the files in both directions to make content of both folders similar. The copy feature is pretty advanced as you can copy changed, unchanged, new, and older content from one folder to other. Plus, transfer content from left folder to right or vice versa is also possible. The only limitation of this software is that you cannot view the folder’s content directly from this software. File Synchronizer is basically a free file synchronizing software for Windows. It is a very simple software with limited features. Interface of this software is divided into two parts which are used to compare the content of the folders side by side. You can add two folders at a time for comparison. One folder is added to the left side, while other one is added to right side of interface. After the comparison, it provides all the non-identical content of each folder on their respective sides of interface. But, one major problem with this software is that it does not show the common content between the added folders. Still, it does show the number of common content. Apart from this, some other useful features like synchronize, clone, etc., are available in this software.